Lead generation is a top goal for many B2B companies, but once you’ve got a list of leads, your work is far from over. Lead generation doesn’t directly make your company money – lead nurturing and conversion does. Direct access to a lead or customer’s email inbox is an opportunity that should not be taken lightly. A lead can click “unsubscribe” or delete an email with a single click, and whether or not they open or ignore an email often depends on subject lines. The subject line is the headline of an email; if the person reading it isn’t immediately curious, there is little to no chance they’ll open and read more. The email subject line is just as important, if not more important, than the entire body of the email. Subscribers won’t get a chance to see the inside of your email if your subject line turns them off. Review these tips for email subject lines that bring more people to the body of your emails and give more subscribers the chance to move throughout the buyer’s journey with you. When email marketing lives up to its potential, it can propel your buyers throughout the customer journey and give them a backstage pass to everything your business has to offer. On the other hand, email marketing gives your business a convenient, automated solution for segmenting your subscriber list and telling an effective narrative to potential customers right in their inbox. Employees spend over 13 hours a week inside their inbox, so they are bound to see the content that you are delivering. Your subject lines will determine whether or not they click on that content. One last quick statistic for you. How important is the subject line of an email? Well, 47% of email users click based on an email’s subject line alone. That is a lot of pressure resting on just a few characters. Don’t throw your subject line away as an afterthought. Put some time into what you are sending out. Emails are far from a special treat; 205 billion emails are sent every single day. You may get to the office and feel like filtering through emails is an absolute chore. So make sure your email stands out by doing some of the work for your readers. Do your readers a favor; tell them what they have to expect inside of the email. Are you sharing a story about your company? Providing exciting offers on latest products? Or just following up on past emails about a deal that is ending soon? Quickly tell users what they are in for, but make it exciting. 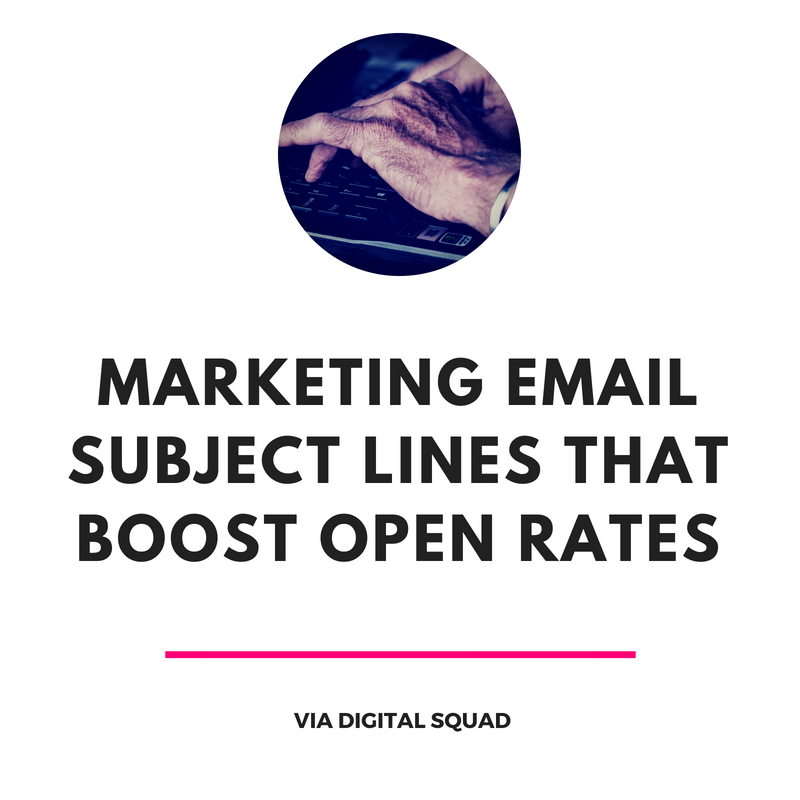 Studies show that adding “newsletter” to a subject line decreases open rates by 18%. Rather than blandly telling users what they are about to read, provide a headline from your newsletter or an interesting statistic. If these are new subscribers who signed up for your email through informational blog posts, provide more in-depth information. Give users a reason to open. This can be done by giving users information that they want to read, creating a sense of urgency or by giving recipients an offer inside the email. If you are sending an email that contains a downloadable attachment, include this information in your subject line. Users who see an attachment without knowing the contents of the email may click away, especially if they see the email hours after signing up for free content. This is another part of providing information. Temporary discounts and offers should be offered as such in the subject line. A subject line like “Hurry! Your discount expires tomorrow!” gives customers a reason to grab the discount and start shopping immediately. If you find that your users are at different places along the buyer’s journey, or signed up for your email list for different purposes, consider segmenting your subscriber list and using different subject lines or content for each segment. Two out of three emails that are opened take place on a mobile device. The subject lines on desktop look different than the subject lines on mobile devices. iPhone users typically only see around 38 characters of a subject line, and Samsung Galaxy users only see around 33. Experts suggest that subject lines should only be around 17-24 characters long to give users the best idea of what they have to read inside, but briefly. CoSchedule has a list of words and phrases that typically decrease open rates. Half of these phrases contain a symbol, including percent signs. If you don’t have to add a symbol to your email subject line, don’t. Show discounts without these types of characters that may turn off readers. Symbols are out, but numbers are in. Studies show that adding a number to headlines could increase traffic by 206%. This principle translates directly to email subject lines and open rates. A number can significantly boost the amount of clicks. However, be careful not to use more than one number in your subject line. Numbers as words (“2” for “to,” “4” for “for,” etc.) comes off as unprofessional and is typically a sure sign of decreased clicks. Email subject lines are a headline, so apply the rules of capitalisation. Capitalise every word (although keeping words like “the” and “and” lowercase are still appropriate) to grab a reader’s attention and communicate professionalism through your headline. Don’t captialise every word in the subject. Users who see too much capitalisation, like too many symbols or numbers, may think that the email is spam and be turned off from opening. Personalised email subject lines are 22% more likely to be opened. Everyone loves to see and hear their own name. If you can include the recipient’s name in the subject line of an email, you will bring their attention to your subject line as they are scrolling through their inbox. This works the other way around, as well. If you are sending a message from your company, encourage a team member who worked on the email to add their name as the person that they email was sent from. Generic emails from a company are easy to scroll through; if users see a real person’s name as the sender, they are more likely to stop and see what the email is about. The small details that appeal to participants in one study may not appeal to your specific subscriber list. In order to create the best email subject lines for your audience, conduct A/B tests. A/B testing splits a segment of your subscriber list in half and sends out two of the same email with a slightly different headline. The headline could be the same exact subject line and have the same exact body, but a single word could be different. For example, one subject line would include the recipient’s name and the other one wouldn’t. Or one subject line would say “Free eBook Inside” and the other one would say “Get your free eBook!” The A/B test wouldn’t go out to your entire mailing list, but once one headline’s open rate proved to be significantly higher than the other, that headline would then go out to the rest of your mailing list. A/B testing is a great way to notice trends and patterns within your subscriber list. As you continue to send out more newsletter and email marketing material, keep these results in mind and optimise each subject line for your specific readers. Enough about email subject lines, right? Even though optimal subject lines are typically around 24 characters long, those 24 characters can have a huge impact on who reads your emails and who gets to enjoy a more personal, intimate piece of content from your company. As more readers click on your emails and click further to other pieces of your content, your revenue, sales, and ROI will burst. Subject lines are a small piece of email marketing. Email marketing is a small piece of a larger content marketing strategy that gives online users something to read and interact with throughout every part of the buyer’s journey. Without content on your website or content to provide users in an email, subscribers will have little incentive to open your emails or want to learn more about your company. If you are looking to expand your content marketing strategy and give users more opportunities to learn and interact with your company, partner up with a top Auckland digital marketing agency. The experts at Digital Squad are here to help you form an effective, optimised content strategy that reaches the right users when they are ready to convert. We also offer conversion rate optimisation strategies to turn your traffic into sales. Reach out to the team at Digital Squad today to get more out of your content marketing strategy.